I was on planes most of today, staring out the window into the clouds and pondering Michelle's first prompt for the Reflective Writing Club. And I got an idea... for a story. I limited myself to 1000 words which was a great exercise for me, as that's the max. story length I set for students in the stories they write in their blogs each week. So, here's my story (and yes, it is shamelessly inspired by Ouspensky's Strange Life of Ivan Osokin... highly recommend!). 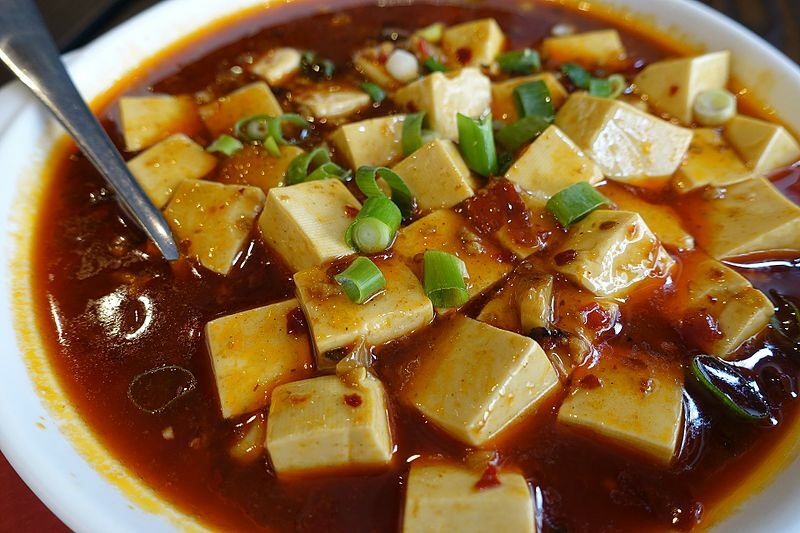 She had gone for a quick lunch at her favorite Chinese restaurant, ordering her usual: ma-po tofu. Extra spicy. Also as usual, there were some college kids at the booth behind her, whooping it up and making a lot of noise, all in good spirits. It was mostly college kids who frequented the place, along with some office workers and grocery shoppers. Such as herself. The waiter gave her a smile as he refilled her water and gestured with his head towards the booth. "These kids!" he snorted conspiratorially. "Everything is just a joke to them. What are they going to say when they have to go work for a living? Someday they are going to be old like you and me! Ha!" She smiled back and said, "Oh, if only I had known back then what I know now. I could have saved myself a lot of trouble!" The waiter rolled his eyes at her sympathetically as he walked off to get her check. He returned with the check, plus the fortune cookie. 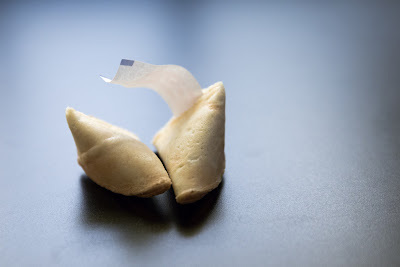 "Good fortune today," he said enigmatically before heading back to the kitchen. She cracked open the fortune cookie indifferently. She read the words on the slip of paper: TALK TO THE BUDDHA it said. "That's an odd one," she thought. And then, she felt it. Something. A shift. The light shimmered, and a loud humming filled the room; the clamor of the college kids faded into nothingness, and instead there was the hum. Rising and falling. Hum. Hummmm. Next, she saw the Buddha. Staring at her with crinkly eyes. It was the fat ornamental Buddha perched precariously in an alcove behind the cash register. She had never really paid attention to him before, but now she felt him looking right at her. She glanced back down at the slip of paper, and then back at the Buddha. "You've got to be kidding," she said, not even sure if she had spoken the words out loud. The rising and falling hum somehow absorbed the words as she spoke them. Abruptly, the humming stopped, everything went dark... and there was the ornamental Buddha, now floating in mid-air, radiating a soft golden light in the darkness. And he was speaking to her. "I heard what you said there. About if only you had known then what you know now. I can help you with that, if you want. Send a message." He paused. She was speechless. He repeated, "I can send a message." "Send a message... to whom?" she sputtered. "I don't understand." "Send a message," he said, "to yourself. Back then. You can tell yourself what you know now. Provided it fits in a fortune cookie. That's the deal: I can send a message, but it has to be in the cookies." He laughed. "Of course I'm being serious. What's the message? What do you wish you had known then that you know now? Keep it short." That was easy; she actually knew what the message would be. It was something she had been thinking about a lot lately. "WE ALL NEED HELP," she said. "That's the message. That's what I wish I had known." She had learned that lesson the hard way. The very hard way. "Your wish is my command," said the Buddha. And then she saw herself, maybe ten years old, in a Chinese restaurant, one she remembered well, with her parents and her brother. She saw herself saying, "WE ALL NEED HELP. How is that a fortune?" Her brother shouted, "Stupid, it's not a fortune. Now listen to mine!" And then.......... she saw herself again. She was in high school. She remembered this restaurant too. And that boy she was with. That boy she had loved. "WE ALL NEED HELP. That's what it says." He looked at her kindly. "I imagine that's true." She had hoped he would kiss her later. But he never kissed her. And then............. again. It was college. Her study buddies, all laughing around the table, adding "in bed" to the end of every fortune like it was the funniest thing in the world. "We all need help," she saw herself saying, answered by a chorus of gleeful shouts from her friends: "IN BED!" And again. .......... And again. .......... As the scenes flashed by, one after another, she realized that she had eaten a lot of Chinese food in a lot of Chinese restaurants. And then, she began to remember. She really had gotten that message in a fortune cookie. Not just once, or twice... but all those times that she was now witnessing. A dozen times? More? And then, she saw the Buddha again. Smiling. "Do you remember now?" he asked. "I do... remember. You sent me the message all those times. I just didn't get it." "Well," he replied, "to be precise, you sent the message. I am just the messenger." "But I didn't get it," she said. "I mean, I got the fortune cookies, I read the words. But ... I didn't get it." 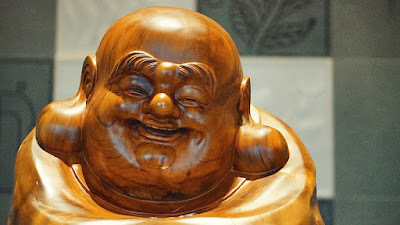 The Buddha smiled again. "But do you get it now...? Say the words, and you'll be back on your way." She wanted to ask him some more questions, to try to understand what had just happened, but he repeated again, "Say the words." And she knew it was time to go. "We all need help," she said. 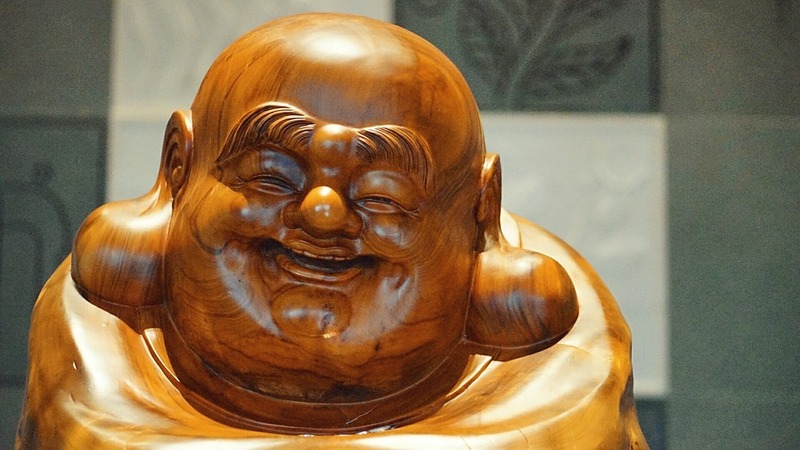 The Buddha smiled his biggest smile. "Yes," he said, "we do." And then... she was back. In her now. The kids in the booth behind her burst out laughing: "...IN BED!" "Ha!" she thought. "Some things never change." She approached the cash register, eyes fixed on the Buddha, perched precariously once again in his alcove. "But now," she said to herself, "I get it: we all need help." "Did you say something?" the waiter asked as she handed him the check. "We all need help!" she replied cheerily. And then he added, "Good fortune today, very good fortune."